At the founding of the UN, the natural family was declared to be the basic building block of nations and worthy of protection and nurturance. That declaration is still in force. 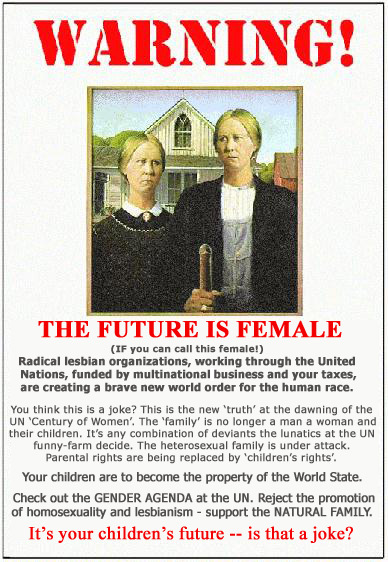 Nevertheless, today, with radical feminists and extremist gender activist having taken control of the UN through non-governmental organizations (NGOs), an all-out war is being waged against the natural family. Check out The Gender Agenda and find out about the history and the state of the war against the family. You may wonder why anyone should worry about a feminist- or female-controlled future world. If so you don't think much of the rights of human males. You may see nothing wrong with a world populated only by females. If that is the case, you obviously think that one half of humanity is not worthy of being kept around, and perhaps you shouldn't be looking at this page. Whatever the case may be, perhaps you should look up a short story, Consider Her Ways, by John Wyndham (first published by Michael Joseph 1961), that describes what such a world may look like. The story is the perfect counter piece to Margaret Atwood's A Handmaid's Tale. In 1961 the story was most definitely science fiction. Today, some prominent feminists propose in earnest that 90 percent of all human males should be either castrated or, better eradicated. Biological science has moved that into the realm of possibilities. Pathological agents do exist that could easily target all of the males in the world or perhaps only males of a certain race. Nobody in a normal state of mind would ever contemplate anything like that, you say? Reconsider. Although the term madwoman is rarely used, it does identify a human condition to which men don't hold a monopoly. There are a lot of women who work in biological sciences. They may have the necessary motivation and the required opportunity to achieve exactly what is being described in Consider Her Ways. Most definitely, many feminist writers addressed the theme of the total eradication of all human males. The idea is a recurring theme of feminist science fiction. I don't recall seeing the corresponding theme of the eradication of all females ever having been mentioned by male authors. However, an item that appeared in the new just during the middle of January 2001 should make anyone think again. PARIS, Jan 10 (AFP) - Australian gene engineers accidentally created a mouse virus that kills every one of its victims by wrecking their immune system, a discovery with the potential for making the ultimate terrorist weapon,New Scientist reports. The killer bug was invented quite inadvertently, while the researchers were trying to create a contraceptive vaccine for mice as a pest control, the British weekly reports in next Saturday's issue. They inserted into a mousepox virus a gene that creates large amounts of interleukin 4 (IL-4), a naturally-occurring molecule that produces antibodies in the immune system. The idea was to stimulate antibodies to destroy eggs in female mice, thus making the rodents infertile. Mousepox, a close relation to smallpox, normally only causes mild symptoms among the type of mice being used in the study, and was only being used as a vehicle to deliver the IL-4. But when the IL-4 gene was inserted, the engineered virus ran amok, attacking the "cell-mediated response" - the part of the immune system that fights viral infection. All the animals in the study were wiped out in just nine days. Worse, the engineered virus was astonishingly resistant to vaccines. A vaccine that would normally protect these mice from mousepox only worked in half of the mice exposed to the killer version. Co-researcher Ron Jackson, of the Canberra-based institute CSIRO, said the discovery was a frightening indicator of what could happen if the human smallpox virus was similarly modified. "It would be safe to assume that if some idiot did put human IL-4 into human smallpox, they'd increase the lethality quite dramatically," he told New Scientist. "Seeing the consequences of what happened in the mice, I wouldn't want to be the one to do the experiment." "It's surprising how very, very bad the virus is," said Anne Hill, a vaccine expert from Oregon Health Sciences University in Portland, Oregon. Smallpox has been eradicated as a disease thanks to a global vaccination campaign, although two laboratories - one in the United States, the other in Russia - still have ampoules containing the virus, under an arrangement with the World Health Organisation (WHO). The incident highlights how easy it could be for some with bio-engineering knowledge to create a murderous virus for which there would be no cure or effective vaccine, New Scientist said. "Vast amounts of time and effort have gone into policing the military's use of biotechnology. But the activities of civilian biologists have been ignored," it said. "Yet genetic engineering techniques are now so widespread that potentially dangerous results are bound to emerge accidentally." It suggests tougher vetting of research proposals; a greater effort to train students in biological subjects about potential dangers arising from lab work; and encouraging greater openness among biologists to discuss the misuse of genetic engineering. The material contained in this file is made available courtesy contributors and editors of Pro-LifeE-News. No doubt, anyone who attempts to manipulate nature in such a fashion is not merely an idiot, he is also quite thoroughly insane, but there certainly is no shortage of insane people in this world. Furthermore, if someone can think of it, is there any doubt that it will be done? Sure it will be done. It most certainly will make those people happy who yearn for negative population growth and a return to pre-Columbian population levels of 300-500 million people in the whole world, right?